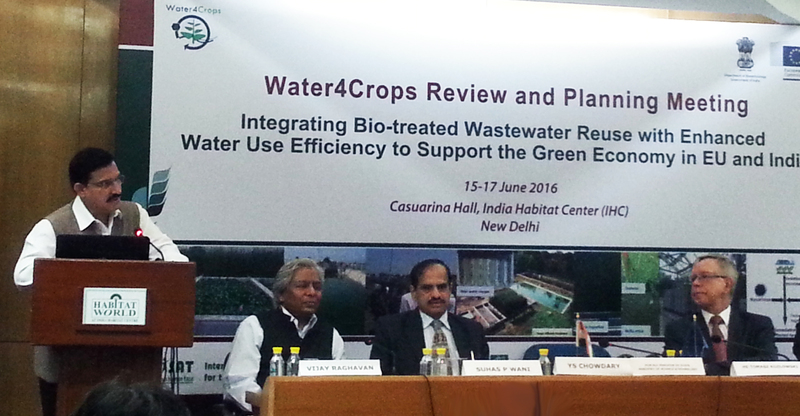 New Delhi, India (15 June 2016) ― The safe reuse of wastewater for agricultural purposes, which has resulted in higher crop yields are successful new results achieved under the European Union and Government of India funded project Water4Crops. The project also proved that the construction of wetlands reduces the amount of pollutants (Chemical Oxygen Demand (COD) in wastewater by 30-92%. The reuse of treated wastewater to irrigate fields has shown increased yields of up to 40% in crops such as okra, brinjal or eggplant and chilly plants as compared to those irrigated by fresh water. These exciting new results were shared by EU and Indian government officials in New Delhi today. It marked the beginning of the projects’ three-day review and planning meeting, titled Integrating Bio-treated Wastewater Reuse with Enhanced Water Use Efficiency to Support the Green Economy in EU and India. Water4Crops is one of the largest EU-India collaborative projects. Through its 7th Framework Program, the European Commission in 2012 funded with 6 Million Euros the four-year Water4Crops-EU project. In the same year, the Government of India through its Department of Biotechnology, put in 3 million Euros for a similar twin project, Water4Crops-INDIA. Mr YS Chowdary, Hon’ble Minister of State, Ministry of Science & Technology and Ministry of Earth Sciences, Government of India, highlighted the importance of treated wastewater for addressing the issues of sanitation and health in rural areas as well as meeting the demand of scarce water resources for agriculture to improve the livelihoods. These results have great potential to be included in Swatch Bharat Mission in reducing pollution and overcoming health hazards byensuring the safe disposal of wastewater in agriculture. “We are delighted that the European Commission’s Framework Program 7 (FP7) and the Department of Biotechnology initiative, have promoted the sharing of research and technologies among participating consortia in India and Europe for the benefit of the common people. We believe that working together globally will provide implementable solutions to the challenges that India faces,” said Mr Vijay Raghavan, Hon’ble Secretary, Department of Biotechnology, Ministry of Science and Technology, Government of India. The EU Consortium includes 21 partners from 8 Countries and an Indian consortium of 11 research and development partners led by the International Crops Research Institute for the Semi-Arid Tropics (ICRISAT). “The bilateral project like Water4Crops in the area of wastewater treatment has strengthened the collaboration between partners from India and EU. This has also led to the development of technologies and shared knowledge across the regions,” said Dr Antonio Lopez, Project Coordinator, Water4Crops, Europe. The Indian consortium partners have demonstrated the use of constructed wetlands as decentralized wastewater treatment systems for both industrial and municipal wastewater. At the SABMiller factory in Sangareddy, Telangana, and K.C.P. Sugar and Industries Corporation Ltd in Lakshmipuram, Andhra Pradesh, wetlands were constructed to treat the effluent coming from effluent treatment plants. Similarly, constructed wetlands were used to effectively treat municipal wastewater at multiple locations in the Indian states of Telangana, Andhra Pradesh, Maharashtra, Uttar Pradesh, and Karnataka. Under the project work, many wetland plant species, such as Canna indica, lemon grass (Cymbopogon), napier (Pennisetum perpureum X Pennisetum americarnum), para grass (Urochloa mutica), typha (Typha latifolia), water hyacinth (Eichhornia crassipes), water lettuce (Pistia stratiotes) and a weed species Agaratum conyzoides, have been identified for purifying the wastewater. They will also be helpful in reducing the nutrient load in the free-water-surface and sub-surface constructed wetlands. Based on the pilot sites at the ICRISAT headquarters in Hyderabad, India and other locations, a total of 28 watershed sites are now supported by various corporates under corporate social responsibility (CSR) projects as well as the Government of Karnataka’s Bhoo Samrudhi program and Andhra Pradesh Primary Sector Mission (APPSM) Rythu Kosam, where a Decentralized Wastewater Treatment (DWT) approach is being implemented and popularized.